Uniqueness of personal spending data – Identifying the limits of anonymity in the emerging big data. For example, in a recent Science paper, we reported that it takes only 4 pieces of spatio-temporal information to uniquely identify a customer’s credit card data amongst millions of other anonymized data records. This brings to the fore an urgent need to re-define how we measure privacy, understand it, and ultimately what drives our privacy needs in an information rich eco-system. 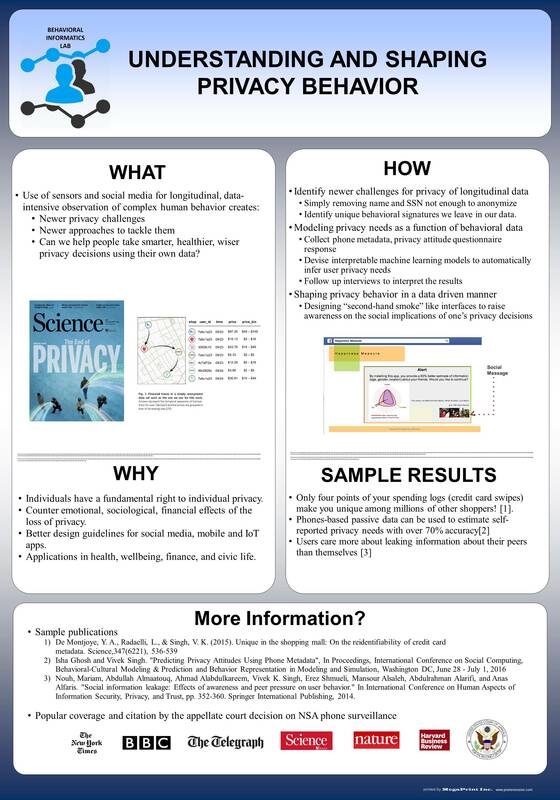 Predicting privacy attitudes using phone metadata – We recently found that a combination of phone use metadata can provide vital insights into a person’s privacy attitudes. This can be used to automatically recommend privacy settings to individuals. Nudging privacy behavior – We took inspiration from “second-hand” smoking cessation campaigns to create interfaces that made users realize that each time they leak information about themselves, by proxy, they also leak information about their peers. We found that individuals thought longer and were twice less likely to give away personal information when made aware of such social consequences of their actions.